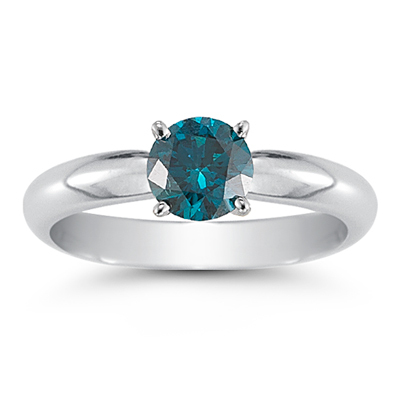 0.59 Cts Round Blue Diamond Solitaire Ring in 14K White Gold . This lovely Blue Diamond Solitaire Ring is studded with a SI quality round Blue Diamond prong set in 14K White Gold. Approximate Diamond Weight: 0.59 Carats. This classy ring radiates romance. The Total Gold Weight of the Ring is 2.76 Grams.